I’ve been back from Patagonia for a week or two and every waking hour has been filled with family time, travelling to lectures, a bit of filmmaking and continuing to work flat out on my injuries book. Oh and a bit of mixed climbing. 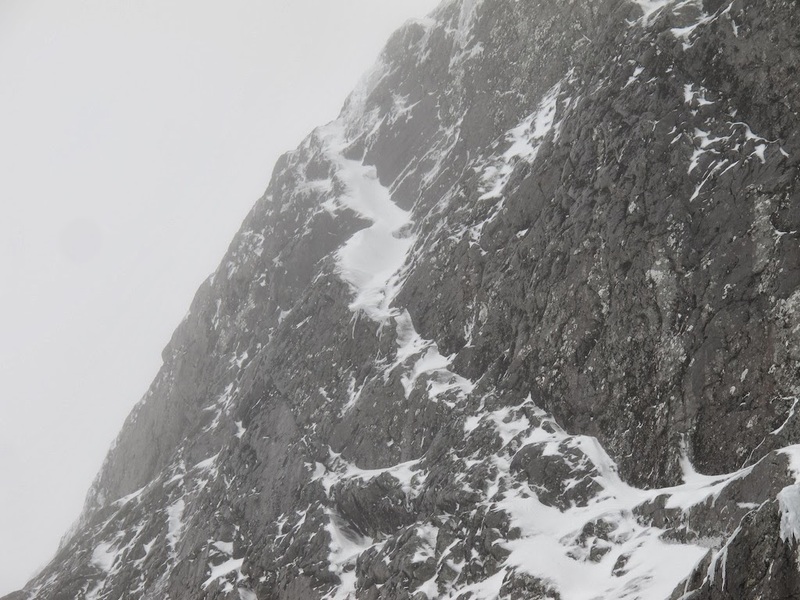 Given the ridiculous volumes of snow on Ben Nevis this season, I had a mind to return to a route I’d had an abortive attempt on a few years ago. Orient Express is a summer E2 5c on the first platform of North East Buttress. After I did the first winter ascent of Steam Train (HVS) just to the right in 2006, I decided to see if it would go in winter. I had my doubts, since it was a slabby and bold looking E2. I guessed it might be too slopey and too bold to be climbable with ice tools. Good winter line for an E2! 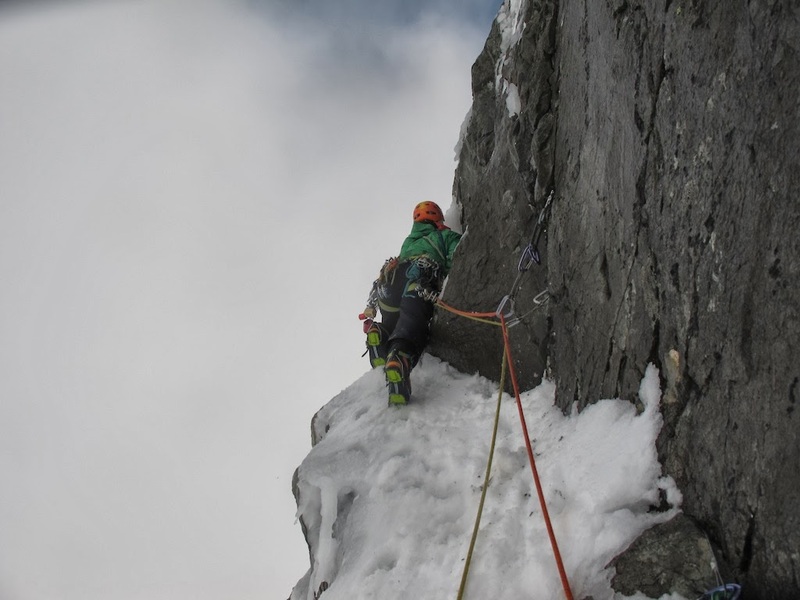 I had a go with Michael Tweedley in a pretty bad blizzard and got to the technical crux, where I could find no hooks at all. It felt like a total dead end, with only rounded smears leading up a steepening in the slabby ramp. But Nevis new lines tend to simmer in my mind, and I felt that if it ever got any real build up on the ramp, there might be some useful neve to make progress. 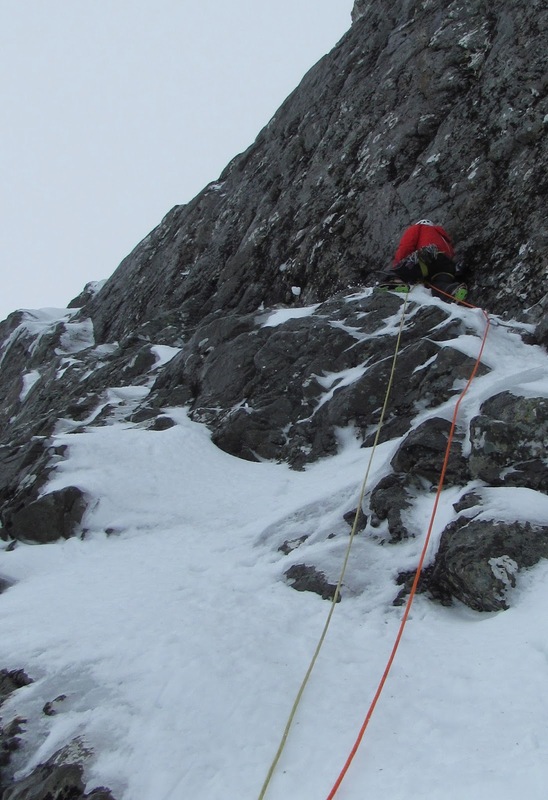 In early Feb I returned with Calum Muskett and subjected him to a long, cold belay while I probed around back at the blank looking crux for ages. There was some cruddy snow sticking to the ramps, but it was useless for the tools. Eventually, I found the tiniest flat hooks, a few mms wide to teeter upwards and onto a good flake and some gear. But above was a long section with only a couple of very poor peckers for protection, followed by another crux to gain access to the upper ramp system. 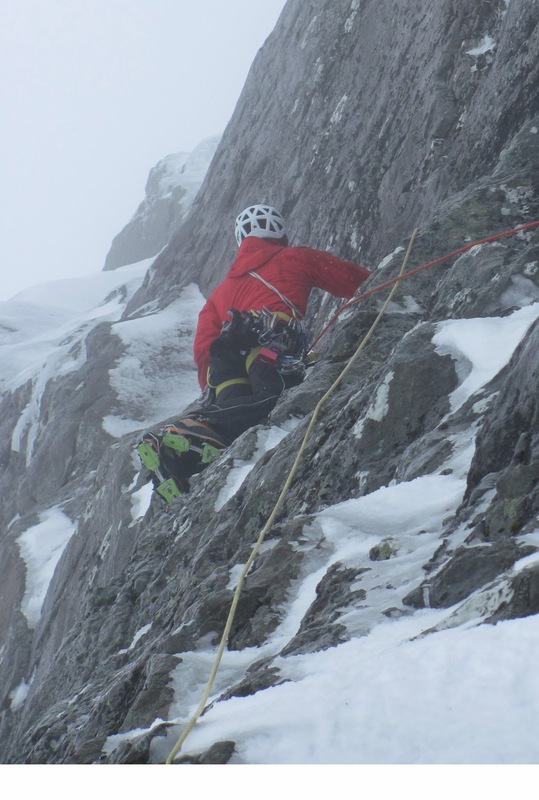 I teetered about for ages, but finally couldn’t find any hooks to get over the bulge and decided to downclimb to the last gear I was happy to weight, apologising to Calum for inflicting such a cold belay on him. The ramps were well covered in snow, and I thought the recent freeze-thaws at this altitude might turn them into some useful ice. So yesterday I returned with Adam Hughes to see if I could get any higher. I regained my highpoint after an hour or so and could see a couple of blobs of cruddy neve well out left of the top bulge. Over the course of a good number of forays, I stretched up and tried to reach the ice blob, but it was just too far. The best I could get was a highly dubious stick just below it. After a bit of working up to it, I committed to swapping hands on the bad stick and reached the ice blob above, which did rip through a bit as I rocked over onto the bulge. Too late, I was either going up, or off! Thankfully the peckers weren’t tested today and we continued up lovely ice on the ramps to the top. 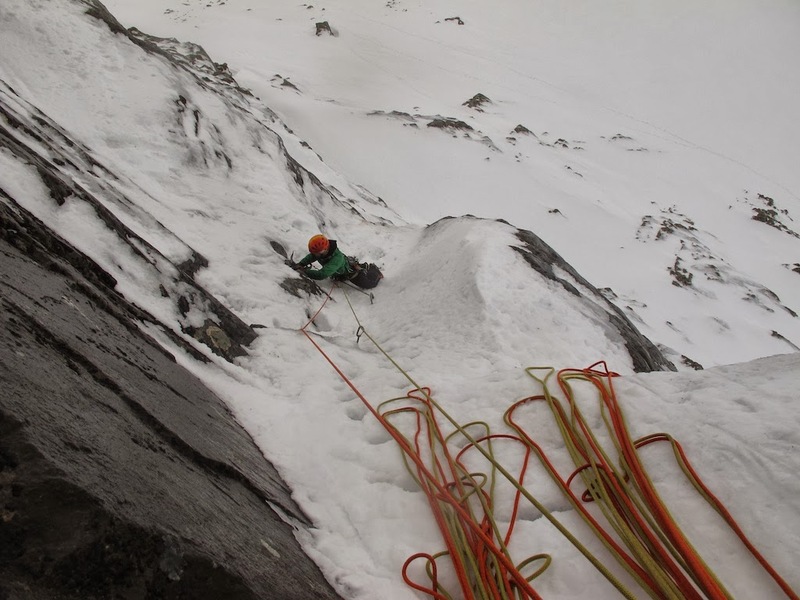 Adam getting stuck into great, if poorly protected ice on pitch 2.